encore: DON'T FEED THE ALLIGATORS! Alligators are supposed to be afraid of us. But visitors to Lake Martin have been feeding them marshmallows and wieners and now they associate people with food instead of fear. Once an alligator loses its fear of humans, it is a danger to humans. When this happens to gators at Lake Martin they must be removed and relocated or, even worse, put to death. Ironically the alligators that are being fed hang out within INCHES of a sign telling people not to feed them. The people who choose to ignore this warning are going to be the first to try to file a lawsuit when they are injured by an alligator. 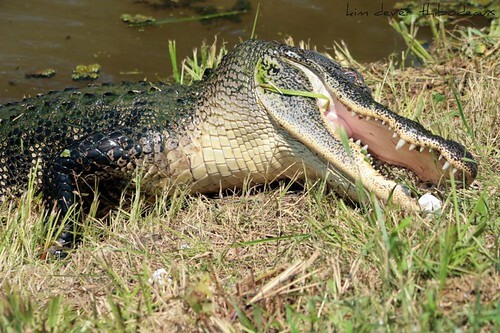 This is a slideshow I made from still shots I took of a one of the larger gators at the lake. It was just hanging out by the roadside (probably waiting for someone to throw it a marshmallow). I was taking pictures of it when it started to move toward the bank. (Yes, I was in my vehicle). Then it came out of the water and picked up a plastic shopping bag in its mouth then retreated back to the water and spit the bag out. Then it came up again. And THAT'S when I discovered that it was coming back for marshmallows that someone had left there! At first I was really upset that people had been feeding it. Then I was amazed that it came up out of the water to retrieve a marshmallow - something so small and sweet! Gators are carnivores known for eating rotting carcasses. Not marshmallows! OK. I'll stop now, because if I don't I'm going to get on the subject of all the LITTER from people throwing stuff at the gators!